The Atmospheric Remote Sensing Group (ARS) investigates remote sensing techniques for climate-relevant atmospheric trace gases like carbon dioxide (CO2) or methane (CH4). Remote sensing methods also retrieve information from layers of the atmosphere that are not easily covered by the in-situ measurements of the tall tower group and the airborne measurement group. Thus they can provide a more complete picture of the state of the atmosphere. They are also less affected by local sources and sinks near the measurement site. The main remote sensing techniques employed by the ARS group. The main project of the group is the operation of a ground based Fourier-transform infrared (FTIR) spectrometer. This instrument measures total-column averaged mole fraction of CO2, CH4 and a number of other trace gases with high accuracy. The measurements cover the whole atmosphere from the ground to the top of the atmosphere around 100 km altitude.. The instrument has been set up on Ascension Island in 2012 for long-term operation. 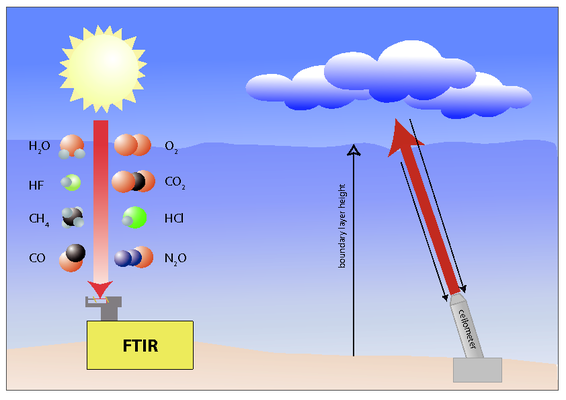 It is part of the Total Carbon Column Observing Network (TCCON), a ground based network of FTIR instruments that provide ground-truth reference data for satellite measurements of greenhouse gases. The group also investigates techniques for measuring atmospheric mixing height (MH) - a very important parameter to determine transport of greenhouse gases from the surface into the atmosphere. Uncertainties in MH are a major error source for atmospheric transport models, so we explore different techniques to actually measure this value at observation sites. Most of our work is based on lidar measurements and the application of commercially available ceilometers for the same purpose.